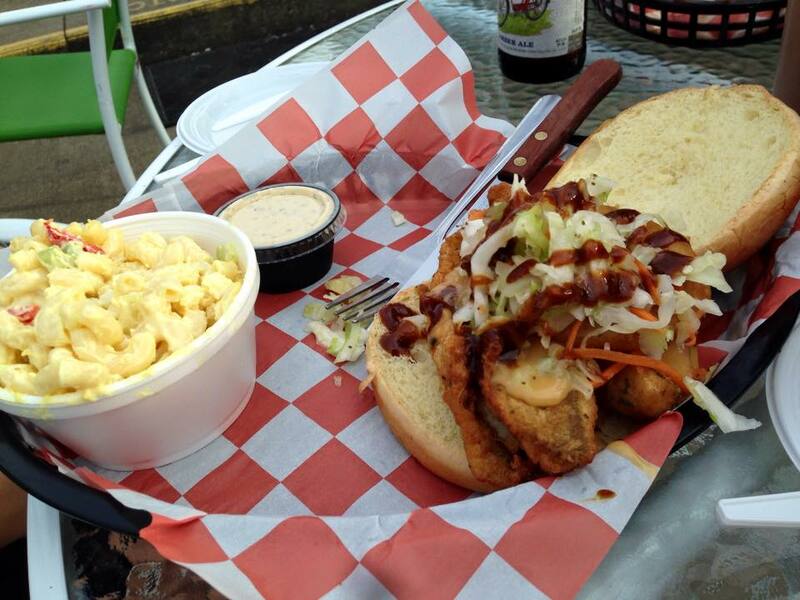 Throughout my entire life I have known of the vast amount of awesome food in our county. 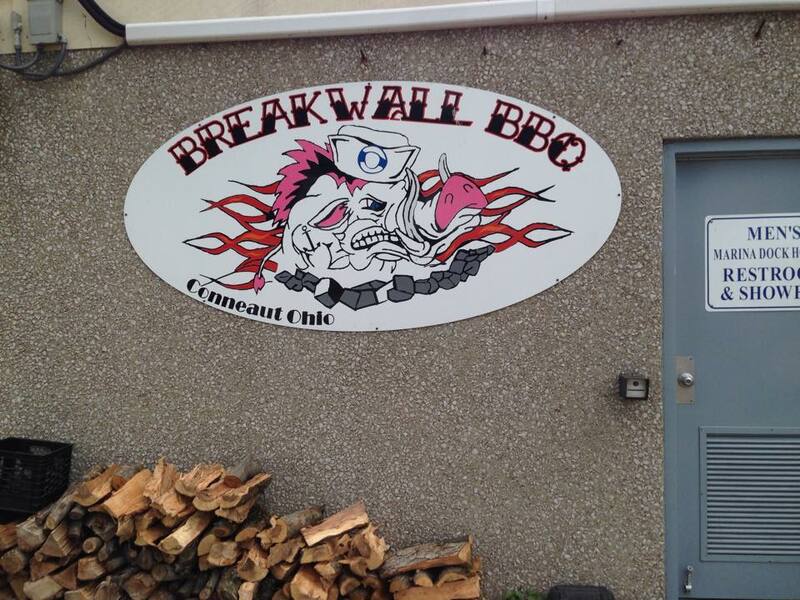 I will be the first to admit that I had never heard of Breakwall BBQ until a friend had mentioned it to me. When trying to figure out where to take the girlfriend (Stephanie) for dinner, my buddy mentioned this exact place. After checking them out online I decided to give it a try. At first it was a little difficult to find if you are not familiar with Conneaut, Ohio. The restaurant is located down in the marina, looking out over the lake (it is honestly such an amazing view that my words alone cannot do it justice). We decided to sit outside. It was a nice day, with a cool breeze rolling in. Our waitress came to our table, and right away I knew it was gonna be awesome. The waitress was very lively and kept conversation going the whole time! So, the two of us decided to start out with a beer, I got Magic Hat’s Pumpkin Ale, and Stephanie got a Fat Tire. 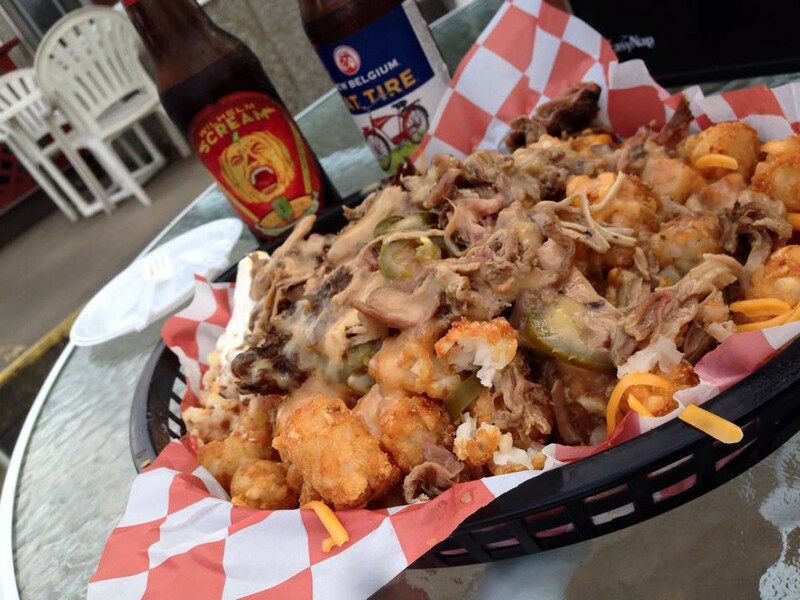 We decided to start out with the loaded tots appetizer, which is tater tots with pulled pork, jalapenos, sour cream, and cheese. I kid you not, the first bite I took I was already in love. I am not sure of many people who do not like tots, but to throw their own homemade pulled pork on it was a step above (I will talk more about the pulled pork when I discuss my meal). We knew that we were gonna get stuffed very quick off of this appetizer, so we decided to put it aside and take it home with us. The meal pictured to the right was mine; The Frankenstein. 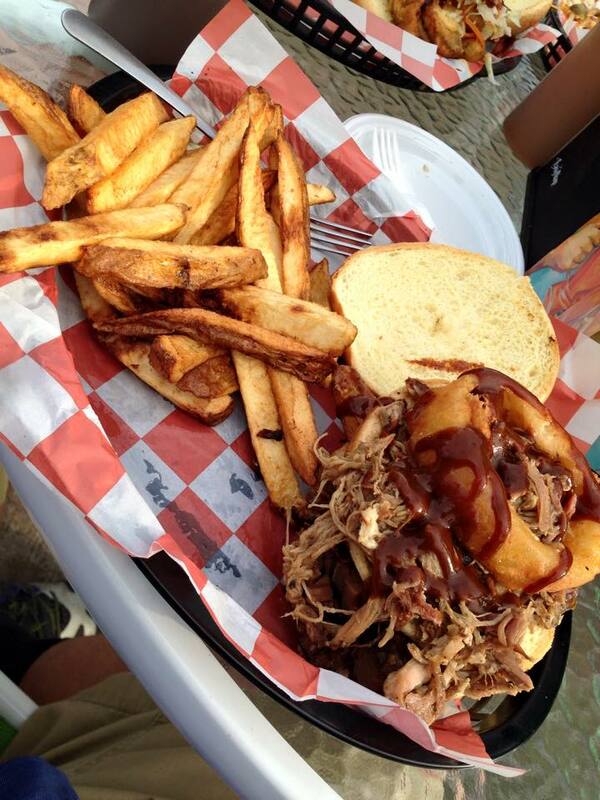 A triple decker sandwich loaded with pulled pork, brisket, and an giant onion ring. While I have been to my fair share of solid restaurants through my years, this one may take the cake as my favorite sandwich ever. The pulled pork is a step above any I have ever had. Most places that serve pulled pork go with a sweet flavor, but at Breakwall you truly get the smokiness flavor, as well as the same with the brisket. I was able to finish all of my sandwich (although the fries were not finished, which is unusual for me). To the left is the meal Stephanie got; the Perch Dinner. The sandwich was awesome, with a nice fish flavor, and a solid flakiness to it (I am not really a fish person so terminology does not come easy). It also came with a cup of macaroni salad, which she said completely hit the spot. Unlike myself, Stephanie was unable to finish her meal (but took it home of course). I cannot truly put into words how much I truly liked Breakwall BBQ, from the awesome staff, to the amazing view, and back to what matters: the food, everything was truly fantastic. Ever since going I have spoken so highly of this restaurant. Definitely on the top of my favorite in the county, and I hope that I am able to get back down there before they close! All of the food at Breakwall is so filling and delicious. I would recommend getting down there as soon as possible, due to they close September 30th. So you still have a few weeks to get down and check it out. Trust me, this is quite possible the hidden gem of the county, and you do not want to have to wait till next year to get this awesome food.